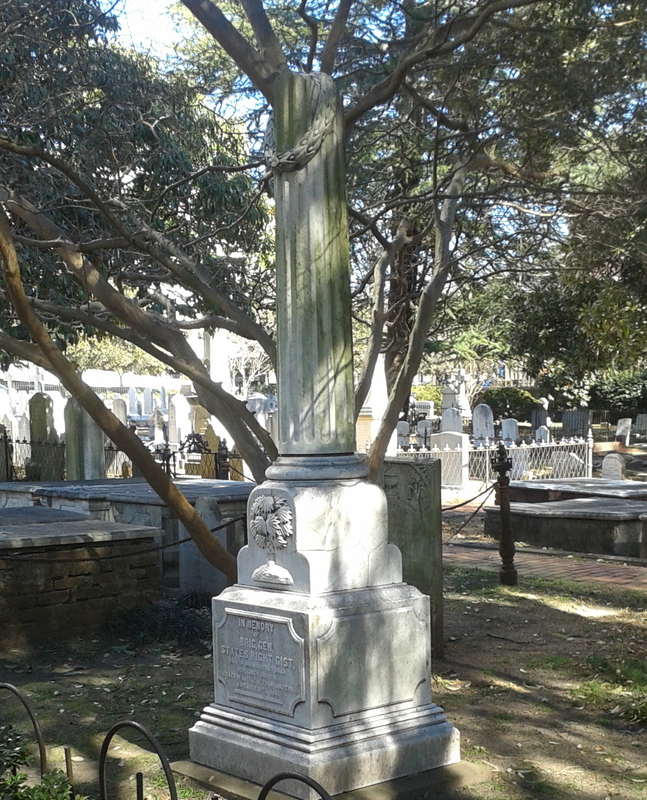 I visited the graveyard along side Sumter Street’s Trinity Episcopal Cathedral on Friday and felt something I didn’t expect—jealousy. 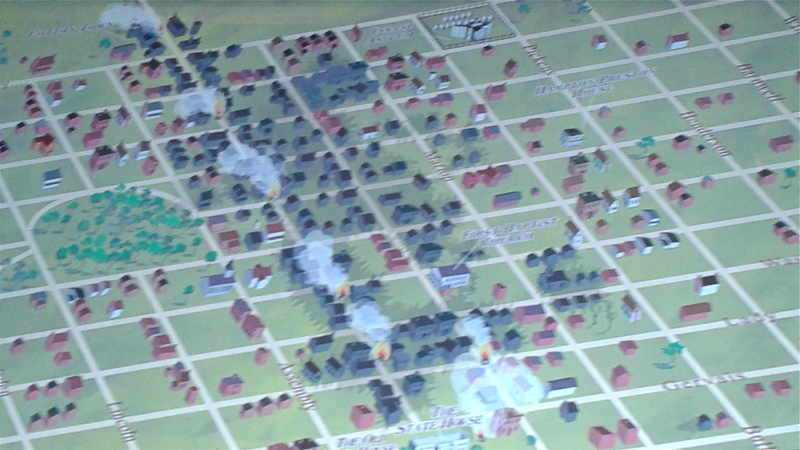 February 17 marked the 150th anniversary of the burning of Columbia led by Union General William T. Sherman. And like many other South Carolinians, I wanted to know more about the burning of my city during the American Civil War—or, War Between the States, if you prefer. When I asked my friend, Joe Long, for recommendations of historic sites to visit, he suggested this graveyard, for starters. Joe works as a curator at the Confederate Relic Room and Military Museum, housed in the State Museum. Confederate Brig. Gen. States Rights Gist was buried at Trinity. The name has a nice ring, no? 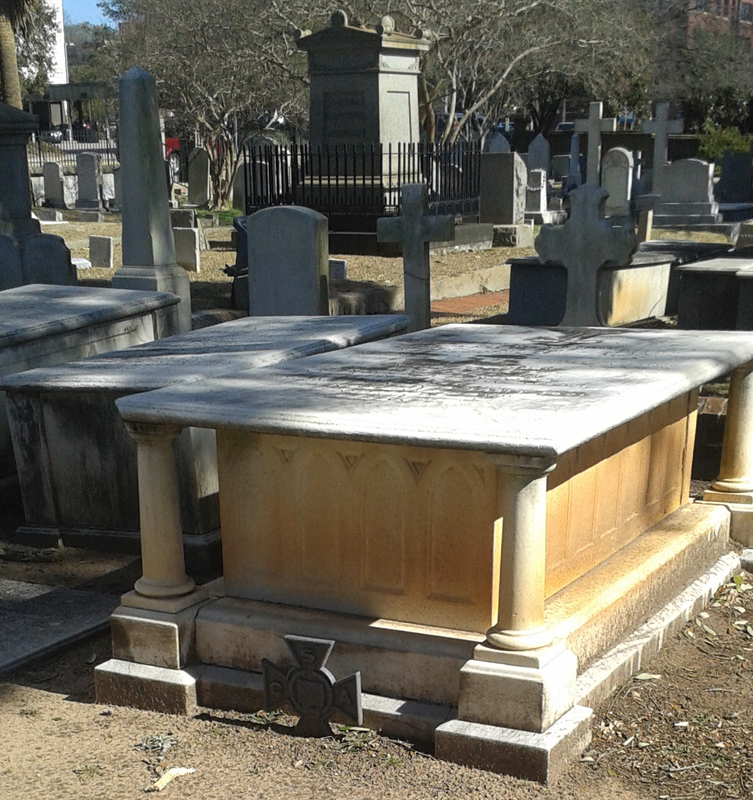 Six South Carolina governors were buried there, including Gen. Wade Hampton III. Three other generations of Hamptons were buried there, also. Until reading the names on some of the headstones, I hadn’t stopped to consider the rootedness of some of these South Carolina families that went before us. I started to feel a little jealous of the families that made our state what it is. The Barnwells, Guignards, Hamptons, Ravenels and others have given South Carolina places their names. The burial place of Brig. Gen. States Rights Gist. Seven churches, two hotels, four schools and 265 homes were among the estimated 450 buildings that were burned. I also thought I’d take on some other light reading—more like skimming—on this anniversary. One indispensable account is the diary of then-17-year-old Emma LeConte, titled “When the World Ended.” She was the daughter of Joseph LeConte, a scientist at South Carolina College—now the University of South Carolina. Emma’s diary shows us the mood of the day and gives a first-hand account of the destruction. Her home was spared, though sparks kept falling on the dry roof. The damage by Sherman’s troops shown in black. This path is on display at the CRR. These accounts are important to our knowledge of history—for those of us whose great grandparents lived here, for those who were born here, and those who got here as fast as we could. We’re all South Carolinians—that’s rooted enough for me. 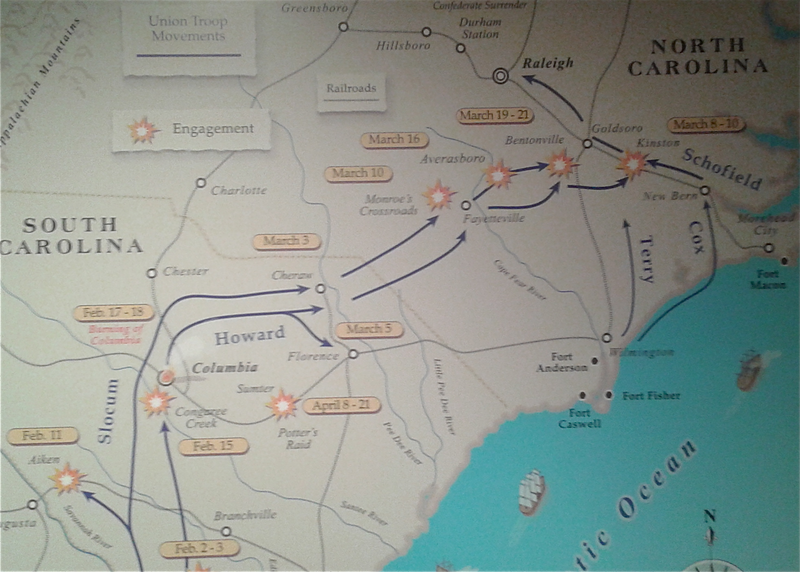 Map of Sherman’s Carolina’s Campaign from Savannah, Ga. to Durham Station, NC. The map hangs in the CRR.